As the world continues to evolve, so too must classrooms. The Solutions for Creating the Learning Spaces Students Deserve series reimagines the norms defining K–12 education. In a short, reader-friendly format, these books challenge traditional thinking about schooling and encourage readers to reconsider their beliefs about what real teaching and learning look like in action. 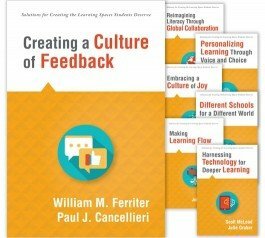 Learn how to shift classrooms from a culture of grading to a culture of feedback. Explore the benefits of a globally connected classroom. Understand how to help students grow into globally aware citizens, risk-takers, innovators, and literate content consumers. Gain effective strategies for improving motivation, instruction, pacing, and feedback in the classroom.